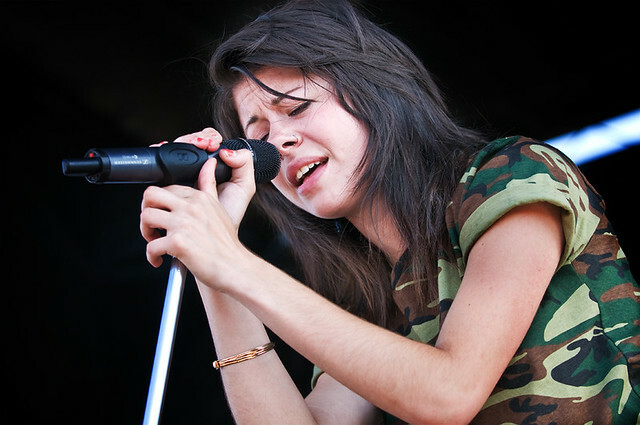 NEW SONG: WE ARE THE IN CROWD'S "LONG LIVE THE KIDS"
Taylor Jardine of We Are the In Crowd performs at Warped Tour in Irvine in 2012. Last month, We Are The In Crowd released their new video for "The Best Thing (That Never Happened)," a first glimpse of what to expect from their upcoming album Weird Kids which drops February 18th via Hopeless Records. Today, the Poughkeepsie band has released a new song called "Long Live the Kids," a rock ballad sure to be instant athem for young kids across America. "Growing up in a small town, it was always difficult to see opportunity. But I had to look past it and stay determined." singer Tay Jardine says about the song. " 'Long Live The Kids' really represents staying true to yourself and holding on to your dreams, even when your surroundings doubt you. Capture that feeling of being a kid- when you were braver than ever and inspired by a tall tree to climb." And judging by the first two songs released in the past couple of months, it's no wonder why FUSE has named Weird Kids one of their "Most Anticipated Albums" of 2014 while MTV Buzzworthy has dubbed front-woman Tay Jardine as one of the "15 Fresh Females Who Will Rule Pop in 2014." Album and bundle pre-orders are now available via Hopeless here: http://hopelessrecords.com/weirdkids/. Fans can also pre-order the album through Best Buy to receive two exclusive bonus tracks here: http://bit.ly/1dwerSI. For tickets and more information about We Are The In Crowd's upcoming US + UK Tours: http://www.wearetheincrowd.com/tour.